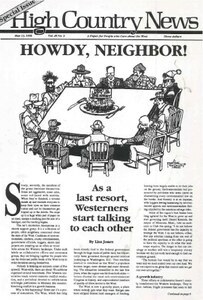 As a last resort, Westerners start talking to each other, in consensus-building groups that seek to find common ground in the land. Consensus-building groups seek to find common ground in the land. The Henry's Fork Watershed Council's struggle created a plan to share and save Idaho's Henry's Fork and Falls rivers. County commissioners, forest rangers and other Montezuma County residents begin to come together to find a way to manage their public lands. The Quincy Library Group of Plumas County, Calif., has won much approval nationally and yet finds itself having to battle the Forest Serivce on its own ground. Sierra Club chairman Michael McCloskey raises doubts about consensus groups - and explores the harm they may cause. Mediator Gerald Mueller of Missoula, Mont., names ingredients necessary for successful consensus groups. Montezuma County Commissioner and Colorado rancher Tom Colbert proves himself an independent and determined thinker. Hank Fischer of Defenders of Wildlife, in his own words, defends the grizzly restoration plan. Seth Diamond of the Intermountain Forest Industry Assn. speaks for the grizzly plan, in his own words, and wonders why environmentalists are against it. Idaho Conservation League conservation director John McCarthy, in his own words, expresses some reservations about the grizzly plan. Program director Michael Scott of the Greater Yellowstone Coalition, in his own words, explains the flaws of the grizzly restoration plan. Keith Hammer of the Swan View Coalition, in his own words, explains why the grizzly bear restoration plan will be bad for the bears. A directory of some Western consensus groups is followed by a bibliography of consensus-building materials. Consensus even came to Washington, D.C. The seventh annual American Forest Congress brought together forest users - and consensus building began to happen. Spring in Paonia, board meeting in Grand Junction, corrections, cowboy poets and other Western writers, odds and ends. President Clinton signs a bill approving the University of Arizona's construction of a third telescope on Mount Graham. Although much of the West had an unusually wet winter, fires are already starting to rage across the dry Southwestern states. Northwestern salmon advocates are shocked by Oregon's decision to extend a permit for Boeing Aviation to divert twice the amount of Columbia River water used yearly by the city of Portland. A group of concerned Ellensburg, Wash., citizens succeeds in getting 12 tall, unsightly power poles removed from downtown. Recent scandals and bizarre antics by a few Northwestern Republicans may open a loophole for Democratic challengers in the coming election. This year, some Idaho Snake River salmon may get to skip the usual barge journey around dams and be allowed to swim over the dams via spillways. The 1996 farm bill offers farmers the best-funded package of conservation incentives yet - but both farmers and environmentalists have misgivings. A dangerous build-up of hydrogen gas at the closed Rocky Flats nuclear facility near Denver, Colo., has activists very worried.